The Twilight Zone meets The Tramp on the way to Sunnyvale Rest Home! Inspired by the 50th anniversary of the classic Twilight Zone episode, Kick the Can, we travel through a dimension of sight and (sometimes) sound, ultimately ending up in 1914, enjoying the silent comic antics of Charlie Chaplin. Join us! This episode is brought to you by Black and White Talkie Talkie. My latest interest is experiencing old television again. 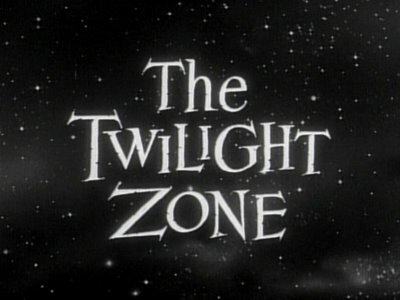 It started with a smattering of I Love Lucy, and is continuing with the original Twilight Zone. I’ve seen nearly all these episodes before, but it’s been a long time. The plots are classic, of course, but what I’ve been most struck by in this reexamination is the quality of the production. I’m streaming them on Netflix in HD, and the level of detail is fantastic. I’ve never seen these shows look better, and it’s a testament to the original production values that we have material able to shine this brightly. Big thumbs up. Can’t wait to experience it all.